Draft: 2008, San Francisco Giants, CAth rd. Married (Amanda)...has one son named Mason. Is an avid stormchaser and has followed the paths of numerous tornadoes in the midwest...also enjoys following the University of Oklahoma football team. Studied meteorology at Wichita State University...earned All-America honors as a junior after hitting .419 (98-for-234) with 11 homers and 82 RBI. Was named Cape Cod League MVP in 2007 after winning the batting title with a .345 average for Falmouth. Graduated in 2005 from Millard (Neb.) High School. Father, Mark, was drafted by San Diego in the 11th round in 1981 following an All-America career at Mississippi State. Hit .262 with 18 extra-base hits in 101 games with San Francisco. Had his contract purchased from triple-A and was added to the Giants' 25-man roster on April 22. Hit .294 with 10 extra-base hits and 14 RBI as starter...made 37 starts for SF (34 at 3B, three at 1B). Went 11-for-51 (.216) with two home runs and nine RBI as a pinch-hitter. Began the season with Chicago-AL and appeared in 58 games, batting .237 with three HRs, 15 RBI. Was placed on the 15-day disabled list with a left hand contusion on April 26 (retroactive to April 22). Was traded from the Chicago White Sox to Los Angeles Angels for cash on July 24. Played in 17 games for the Angels and hit .203 with one homer and nine RBI. Was designated for assignment on August 18. Established career highs in hits (131), doubles (31), triples (5), RBI (57), runs scored (50), average (.282), total bases (193) and extra-base hits (43) in his second season with Chicago...Appeared in 127 games, including 120 starts at third base and committed 12 errors, down from 16 in 2013...Average was above .300 every day through 8/29 (.302)...Hit .300 (108-360) vs. right-handers and .221 (23-104) vs. lefties … six of his seven home runs were off righties...Ranked sixth in the American League with a .311 average (73-235) on the road...Recorded a .326 average (84-258) in the first half and a .228 (47-206) mark after the break...Posted the following averages: .335 (63-188) with runners on base, .309 (34-110) with RISP, .309 (17-55) with RISP/two outs and .364 (4-11) with the bases loaded … was 4-7 (.444) with a homer and four RBI as a PH...His .394 average (28-71) in May ranked second in the major leagues behind the Dodgers' Yasiel Puig (.398)...Made his first career Opening Day start at third base...Opened the season with a career-high, 11-game hitting streak from 3/31-4/14 … batted .341 (14-41) with four doubles, nine RBI and five runs scored during the streak, which was the longest by a White Sox third baseman since Joe Crede in 2005 (14)...Collected a career-high four RBI on 4/11 vs. Cleveland...Was placed on the disabled list on 4/26 with a left hand contusion after missing the previous four games … appeared in three injury rehabilitation games with Class AAA Charlotte before being reinstated on 5/7...Was 2-4 with a RBI in his first game back on 5/8 vs. Cubs...Hit safely in eight straight games from 5/12-21, batting .433 (13-30) with two doubles, a triple and two RBI...Recorded a RBI in three consecutive games from 5/25-27 and 6/8-11...Collected a career-high four hits, including three doubles, on 5/26 vs. Cleveland … became the first Sox with three doubles since Paul Konerko on 5/26/12 vs. Cleveland...Registered a 10-game hitting streak from 6/15-25, batting .341 (15-44) with four doubles and four RBI (five multihit)...Hit his first home run on 7/1-2 vs. the Angels...Homered in three straight games for the first time in his career from 7/8-10 at Boston, including a game-tying, two-run pinch shot off Koji Uehara on 7/10...Recorded three straight multihit efforts from 7/24-26, matching his career long (third time)...Hit a game-winning, RBI single off Fernando Rodney in the 10th inning on 8/9 at Seattle...Connected on his first career grand slam and matched his career high with four RBI on 8/17 vs. Toronto...Drove in a run in a career-best four straight games (six RBI total) from 9/13-16. Spent his first full season in the major leagues … ranked among the American League rookie leaders in games (2nd, 134), walks (2nd, 37), home runs (T2nd, 13), hits (3rd, 100), total bases (3rd, 159), runs scored (T3rd, 46), triples (T3rd, 3), extra-base hits (4th, 30) and RBI (5th, 40) … ranked fourth on the team with 13 home runs … appeared in 113 games (107 starts) at third base and 12 (two) at first … batted .261 (90-345) with 12 home runs and 35 RBI vs. right-handers … combined to hit .284 (40-141) from April-May (.225 from June-September) … hit .302 (38-126) from the No. 7 spot, his best mark … posted a .943 fielding percentage (16 E/280 TC) at third base … made his White Sox debut as a defensive replacement at first base on 4/1 vs. Kansas City … started his first game at third base on 4/6 vs. Seattle … hit his first home run with the White Sox on 4/22 vs. Cleveland … hit safely in six straight games from 4/26-5/2 (.364, 8-22) … hit a game-winning solo homer in the seventh inning on 5/1 at Texas … collected three hits, including a game-ending single in the ninth inning, on 5/25 vs. Miami … snapped an 0-23 stretch with a three-run home run on 6/11 vs. Toronto (career-high three RBI) … matched his career high with three hits on 8/21 at Kansas City … hit a game-winning solo home run in the 12th inning on 8/22 at Kauffman Stadium … hit his first career pinch homer in the 10th inning on 9/7 at Baltimore … recorded three straight multihit games from 9/8-10 (.600, 6-10). Appeared in six games in his third season with San Francisco … was recalled by the Giants on 5/3 … made five consecutive starts at third base from 5/3-7 … collected a RBI in consecutive games from 5/5-6 vs. Milwaukee … was optioned back to Fresno on 5/13 for the remainder of the season. 24-year-old infielder began 2011 season in triple-A Fresno...batted .297 (127-for-428) with 22 2Bs, 63Bs, 11 HRs, 61 RBI and 9 stolen bases in 124 games with Grizzlies. ... Was recalled by San Francisco on June 5...made 1 start(3rd base) and appeared in 5 total games, collecting 2hits in 7 at-bats before being optioned back to Fresno onJune 11. ... Was promoted to San Francisco again on Sept. 2 andfinished 2011 season on big league roster. ... Made 2 starts (both at 3rd base) and went 5-for-19 (.263)with HR and 2 RBI in 15 games in Giants uniform...went2-for-10 (.200) with 2 BBs in pinch-hit situations. ... Collected his 1st Major League home run (inside-the-park)vs. Colorado on Sept. 27...became 1st Giants player to hitinside-the-park homer for his 1st career Major League HRsince Dax Jones accomplished feat on Aug. 18, 1996 atPhiladelphia...marked 1st inside-the-park home run sinceAndres Torres did it on July 4, 2010 at Colorado...wasalso 6th occurrence in AT&T Park history and 4th by Giant. ... Became 4th Giant to hit inside-the-park HR as his 1stcareer HR, joining Skip Pitlock (Aug. 8, 1970 vs. HOU),Johnnie LeMaster (Sept. 2, 1975 vs. LAD), and Dax Jones(Aug. 18, 1996 at PHI). Batted .287 (141-for-491) with 25 2Bs, 8 3Bs, 8 HRs and 67 RBI in 132 games at double-A Richmond ... His 8 3Bs were 2nd-most in Eastern League ... Hit .313 (56-for-179) after All-Star break for Richmond compared to .272 (85-for-312) before break ... Played for Scottsdale Scorpions in AFL during Winter Leagues, hitting .306 (22-for-72) with 6 2Bs, 5 HRs and 16 RBI in 20 games ... Was tied for most HRs in AFL with 5...his 16.00 plate appearances/SO was best in AFL. Helped lead Single-A San Jose to California League title after batting .286 (134-for-469) with 31 2Bs, 2 3Bs, 4 HRs and 67 RBI in 126 games in what was his 2nd professional season...was Giants' primary 3rd baseman, appearing in 116 games at corner spot...however, committedteam-high 27 errors...among team leaders ranked 3rd in hits, 2Bs, RBI and games played...struck out once every 7.79 plate appearances, which was 4th-lowest ratio in league...recorded season-best 13-game hitting streak Aug. 14-28, batting .388 (19-for-49) during stretch...streak was 2nd-longest on club behind Thomas Neal's 15-game stretch...collected season-high 4 hits twice: April 28 at Lancaster (4-for-5, 3 runs, 2 2B's, 4 RBI) and Sept. 6 at Lake Elsinore (4-for-6, HR, 4 RBI). October 2, 2017 1B Conor Gillaspie elected free agency. August 30, 2017 Sacramento River Cats placed 1B Conor Gillaspie on the 7-day disabled list retroactive to August 28, 2017. August 5, 2017 San Francisco Giants sent 1B Conor Gillaspie outright to Sacramento River Cats. August 3, 2017 San Francisco Giants designated 3B Conor Gillaspie for assignment. July 7, 2017 San Francisco Giants activated 3B Conor Gillaspie. July 4, 2017 San Francisco Giants sent 3B Conor Gillaspie on a rehab assignment to San Jose Giants. July 4, 2017 sent 3B Conor Gillaspie on a rehab assignment to San Jose Giants. July 3, 2017 San Francisco Giants sent 3B Conor Gillaspie on a rehab assignment to Sacramento River Cats. June 23, 2017 San Francisco Giants activated 3B Conor Gillaspie from the 10-day disabled list. June 10, 2017 San Jose Giants sent 3B Conor Gillaspie on a rehab assignment to Sacramento River Cats. June 3, 2017 San Francisco Giants sent 3B Conor Gillaspie on a rehab assignment to San Jose Giants. May 19, 2017 San Francisco Giants sent 3B Conor Gillaspie on a rehab assignment to Sacramento River Cats. April 22, 2016 San Francisco Giants selected the contract of 3B Conor Gillaspie from Sacramento River Cats. February 8, 2016 3B Conor Gillaspie assigned to Sacramento River Cats. February 3, 2016 San Francisco Giants signed free agent 3B Conor Gillaspie to a minor league contract and invited him to spring training. October 5, 2015 3B Conor Gillaspie elected free agency. September 28, 2015 Salt Lake Bees activated 3B Conor Gillaspie from the 7-day disabled list. August 22, 2015 Los Angeles Angels sent 3B Conor Gillaspie outright to Salt Lake Bees. August 18, 2015 Los Angeles Angels designated 3B Conor Gillaspie for assignment. July 25, 2015 Los Angeles Angels activated 3B Conor Gillaspie. July 24, 2015 Chicago White Sox traded 3B Conor Gillaspie to Los Angeles Angels for cash. July 19, 2015 Chicago White Sox designated 3B Conor Gillaspie for assignment. May 7, 2014 Chicago White Sox activated 3B Conor Gillaspie from the 15-day disabled list. May 4, 2014 Chicago White Sox sent 3B Conor Gillaspie on a rehab assignment to Charlotte Knights. June 28, 2013 Chicago White Sox activated 3B Conor Gillaspie from the paternity list. June 26, 2013 Chicago White Sox placed 3B Conor Gillaspie on the paternity list. February 22, 2013 San Francisco Giants traded 3B Conor Gillaspie to Chicago White Sox for RHP Jeff Soptic. October 29, 2012 San Francisco Giants recalled Conor Gillaspie from Fresno Grizzlies. July 19, 2012 Conor Gillaspie roster status changed by Fresno Grizzlies. July 7, 2012 Fresno Grizzlies placed 3B Conor Gillaspie on the 7-day disabled list. May 30, 2012 Fresno Grizzlies activated 3B Conor Gillaspie from the 7-day disabled list. May 25, 2012 Fresno Grizzlies placed 3B Conor Gillaspie on the 7-day disabled list retroactive to May 23, 2012. May 13, 2012 San Francisco Giants optioned 3B Conor Gillaspie to Fresno Grizzlies. May 3, 2012 San Francisco Giants recalled Conor Gillaspie from Fresno Grizzlies. March 31, 2012 San Francisco Giants optioned Conor Gillaspie to Fresno Grizzlies. September 2, 2011 San Francisco Giants recalled Conor Gillaspie from Fresno Grizzlies. June 13, 2011 San Francisco Giants optioned Conor Gillaspie to Fresno Grizzlies. June 5, 2011 San Francisco Giants recalled Conor Gillaspie from Fresno Grizzlies. March 14, 2011 San Francisco Giants optioned Conor Gillaspie to Fresno Grizzlies. 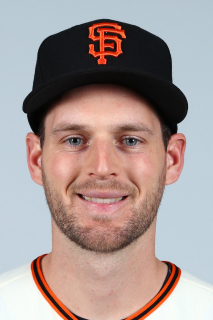 November 6, 2010 Conor Gillaspie roster status changed by San Francisco Giants. August 31, 2010 Conor Gillaspie assigned to Scottsdale Scorpions. October 19, 2009 Conor Gillaspie roster status changed by San Francisco Giants.